Starting at $19.99 for the First Four Months! Music is literally our day job! Our instructors are not accountants or plumbers who teach music on the side, they are musicians and teachers. Most instructors have degrees in music. Whether they’ve earned a bachelor’s degree in music education or a doctorate in music performance, we have an instructor that will cater to your ability and work well with you personally. Learn More About our Teachers! We offer School Instrument Rentals! In partnership with National Educational Music Company, we are able to provide the educator-approved, quality instrument your student needs and our great local service – all at an affordable rate! We know how important it is to have your instrument for school classes or weekend performances so our repair staff is on site daily to make sure you don’t miss out. Custom repair consultations are available so that you can be absolutely sure you are getting an instrument that plays to your specifications. We are also available all weekend to handle emergency repairs. Have you signed up for lessons with one of our talented instructors? If so, you can sign in to your online lesson dashboard right here! Our online portal lets you view your assignments, pay for lessons, and reschedule upcoming appointments. Use the username and password given to you by your instructor - if you don't remember, give us a call! Having trouble? Give us a call at 860-344-0525. 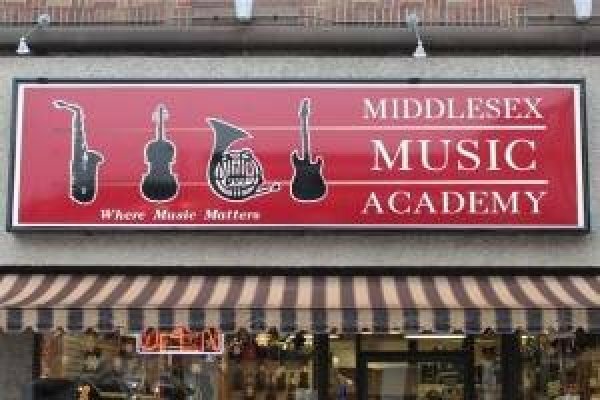 Welcome to Middlesex Music Academy! Our main goals are to advance our students’ musical abilities through first class instruction and to encourage their talents by providing them with opportunities they would not receive elsewhere. Our teachers are professionally trained, with degrees in Music. Our professionally designed lesson studios create the optimal learning environment, where a student can focus on their instrument and tone. We also offer opportunities where students can perform. Whether at the local performing arts center or the downtown coffee shop, students can choose to perform and showcase their talents either as a soloist or as part of an ensemble. We stock a full line of instruments & accessories and do repairs “in house.” We are a fully stocked “brick & mortar” music store! So, don’t forget to stop by and browse our ever changing inventory of new, vintage, and used instruments. Our inventory is competitively priced and restocked daily so you can always get what you need to succeed. Our repair staff is always here to help too. Instrument repairs are done in-store so you get your instrument back in a timely fashion. We know how important it is for you to have your instrument for school classes or weekend performances so our repair staff is here to make sure you don’t miss out. Our knowledgeable staff can answer any of your questions so you can make an informed decision about your musical career. Whether you have been playing for 20 minutes or 20 years, there is always something to learn. We are here to help make learning fun and to provide you with the tools you need for success.